Observations that Paterno's health — body and mind — have declined noticeably should be heartbreaking. So why aren't we as sad about it as we ought to be? Paterno fought a couple of health issues over the summer, relatively minor for someone in the peak of health, but apparently severe for a man of 83. He made his first public appearance this week for Big Ten media days, and seemed much, much worse than anyone had remembered. The difference, just since his appearance in April before the Blue-White intrasquad scrimmage, is noticeable. It's much different than when he was in obvious pain from an arthritic hip two years ago and a shattered knee four years ago. Then, he wore the frown of a tough guy fighting pain. Now, he shows no pain at all. It's just that his speech was slow and slightly slurred, and his intellect seemed a little dulled and delayed - something that's never, ever been true. There have been calls for Paterno to hang it up for a long time now, peaking in concert with Penn State's struggles at the beginning of the decade, and his incapability of walking the sidelines for games. But the man's a legend, and he deserves to hang it up when and how he sees fit. He may be doing himself a disservice. The buzz about his health this week hasn't really been about his health at all. Instead of worrying about an old man whose spark is rapidly dimming, we're just talking about how it will affect his coaching. That inability to separate the man and his job reminds us another old coach who's been in the news: former UNC stalwart Dean Smith. Smith called it quits at the relatively young age of 66, but has recently been back in the news as his legendary memory has begun to fade. We teared up a little when we read about Smith not being able to remember the names of friends, or even be totally aware of where he is. Why such a strong reaction? Men grow old; their minds go; they die. But with Dean Smith, it's that contrast between what he was on the sidelines at Chapel Hill and what he's become which throws his decline into such stark relief. Coach Smith, the legend. Dean Smith, private citizen, the doddering old man. To us, that's heartbreaking. But Paterno, by continuing to coach, denies himself that dichotomy. Instead of seeing in our heads a young Joe Pa, and clinging to that memory when we see the sharply deteriorated version today, we instead picture a gradual downslope, with the changes barely noticeable from year to year. There aren't two Joe Paternos, like there are two Dean Smiths. There's just the one, standing at the podium on Monday, straining to be heard. We're saddened by the declines of both men. 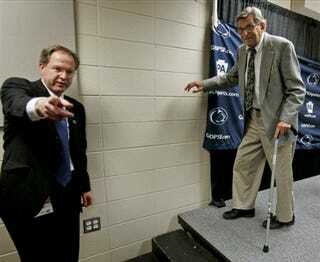 But there's something else there with Paterno that just doesn't exist when we think of Dean Smith. For Joe Paterno, we feel pity. That's never how things should end.